The recent GF Herald article about housing prices brings to the forefront an issue with housing price calculations. The Herald used index numbers based on sales, which is problematic. What was the composition of sales in a given month? If there were only high value homes there could be sample issues. Also, when you attempt to make a comparison between two areas you have a double issue with the inconsistency of samples. These indices are not seasonally adjusted so I calculated the percentage change from one year ago to remove any seasonality. Notice the two series essentially grow together. Notice though that the purchase only grows faster over the last several years meaning the appraisals included in the all transactions series are bringing the growth down. 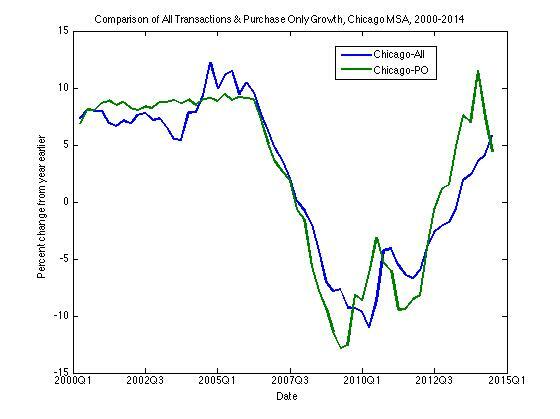 We see the same thing in the data for Chicago. 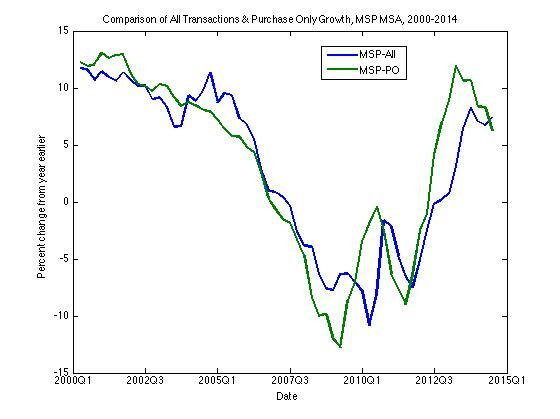 Once again, the purchase only data saw stronger growth in the last few years, though the last few quarters saw a decline back to the all transactions data. The issue is this: it is difficult to talk about housing prices. There are indices we can use, but we need to understand the composition to make meaningful comparisons. Trends are also superior for comparison’s sake than individual, or just a few, price points.